District 12’s favorite baby-faced archer is back in The Hunger Games: Catching Fire. The sequel to the 2012 mega blockbuster, The Hunger Games, picks up right after Katniss (Jennifer Lawrence) and Peeta (Josh Hutcherson) won the 74th Hunger Games. The two “lovebirds” are on victory tour going from district to district giving speeches. Seriously, the first 45 mins of the film could’ve had a stamp that read “Previously on The Hunger Games….”in the lower corner. After Katniss and Peeta’s defiant stance at the end of the games, she’s become a symbol for hope for people in the districts. President Snow (Donald Sutherland) blames Katniss’ victory tour for the uprising occurring in the districts across Panem. Unable to kill Katniss, President Snow and the new game maker Plutarch (Phillip Seymour Hoffman) decide to make the 75th Annual Hunger Games a “Quarter Quell”, meaning all the tributes for the game will come from a pool of previous Hunger Games victors. 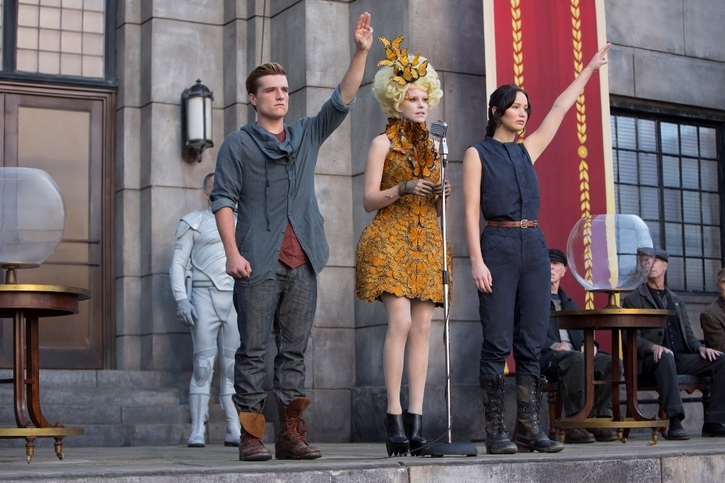 After Katniss is selected, Peeta volunteers and the two head back to the Captiol to train with Haymich (Woody Harrelson) and Effie (Elizabeth Banks) one more time. The training sequence is a lot like the first movies but it introduces Finnick (Sam Claflin), Beetee (Jeffrey Wright), and the hilariously outspoken Johanna (Jena Malone). Honestly, Catching Fire is a like the first movie – Katniss and Peeta are trying to survive a Hunger Game – and that’s not a bad thing. We don’t learn a lot about the other tribute, so these games are about Katniss, Peeta, and their allies trying to survive in the arena. At no point does Catching Fire every try to be something that it’s not. At no point do you ever feel like Katniss is in any real danger. The film never tries to soar above being a really fun popcorn movie with a little social commentary sprinkled on top. Jennifer Lawrence is the star of the film and it’s almost impossible for her not to overshadow the other actors, but Jenna Malone is Catching Fire’s scene stealer and Sam Claflin plays a charmingly arrogant Finnick really well. Jeffrey Wright even adds his acting powers to the supporting cast. Putting a stronger supporting casts around Jennifer Lawrence this time was brilliant – the film doesn’t rely on her carry the movie for two hours. If there is one gripe it’s the 146 minute runtime. You can file that runtime under “not necessary”. I’m not sure who thought making it long was a good idea, but there’s about 15 minutes of fat that could easily be trimmed from the movie. I don’t need to see Katniss and Gale (Liam Hemsworth) sitting alone in an empty field with Gale wearing his Gale sad face again. That’s not even deleted scene worthy. Stanley Tucci does not get enough credit for how amazing he is as Caesar. His comedic performance is severely underrated. He’s manages to grab your attention and be funny every time he’s onscreen. I can listen to him say, “HUNNGAAAH GAYYYMEEEEEZZZZ” all day long. The final 45 minutes of Catching Fire are so entertaining, it’s impossible not to like this movie. It’s got a lot of really imaginative action sequences, some good comedy, a few touching moments, and a cliffhanger that’s going to make fans want tickets for Mockingjay right now. Posted in Uncategorized and tagged action, comedy, Grade: B, Hunger Game, Jennifer Lawrence, Josh Hutcherson, Katniss, Katniss Everdeen, List of The Hunger Games characters, Peeta Mellark, Sam Claflin, Stanley Tucci, The Hunger Games: Catching Fire. Bookmark the permalink.